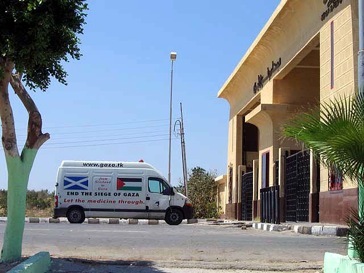 Ten days after setting out from Edinburgh, five days past their projected July 15 arrival, Scottish humanitarian Khalil Al Niss and his wife Linda Willis finally pulled up Sunday afternoon at the Gaza-Egypt Rafah crossing only to be denied entry to Gaza. The Gazan side, just over 100 meters from the Egyptian gate and Israeli-constructed wall, is visible from where the couple’s van sits idle; doctors inside Gaza wait for the expected delivery of essential medical aid. Having arrived by ferry after 11 pm, Khalil and Linda were made to wait over 24 hours at the border town of Nuweiba, where Egyptian authorities sent them around repeatedly to six different departments to fill out form after form. Once again, the van was unloaded, Egyptian officials inspecting the contents and re-loading,satisfied the couple really was bringing in vital medicines and equipment. “Egyptian bureaucracy is amazing. We sat, had tea,filled out forms and were told ‘okay, you’re ready to go now. 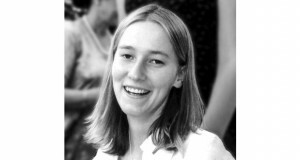 Just goover to that office there and fill out one more form,’ Linda told Daily News Egypt. Just after 1 pm Sunday they drove into Al-Arish,the pair weary but pleased to have made it to their second-lastdestination. “We’re completely exhausted. Since Wednesday morninguntil now we’ve only slept a cumulative 10 hours,” said Linda. Lindaand Khalil have driven day and night in a van crammed with urgently-needed medical supplies and equipment to reach north-eastern Sinai’s Rafah. They are part of a growing trend of international citizens who have decided to help end the Israeli siege on Gaza where residents are denied the most basic necessities—including vital medicines and hospital equipment parts. Native Scot Linda and Jerusalemite Palestinian living in Scotland, Khalil, took time off from work, ferried to Belgium, and continued drivingthrough Germany, Austria, and Slovenia. 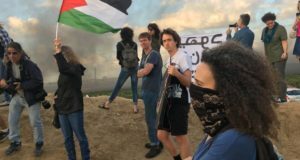 Although the team anticipated difficulties crossing borders with a van decked out in the Palestinian and Scottish flags and filled with medicines, they hadn’t expected a flat-out denial of entry. Arriving at Croatia’s border, the pair was refused entry, causing them to backtrack and alter their route, driving instead through Romania, Hungary and Bulgaria to cross via Turkey two days later. Thankfully, travel got easier after Turkey. In Jordan,the duo once again faced excessive red tape and an unwillingness to allow them passage, a reticence which again surprised them given Jordan’s large population of Palestinian refugees. After again partially unloading the van, four hours later they boarded a ferry bound for Egypt. Yet it turns out that the last and most trying delays have come in Egypt, first at Egypt’s border with Jordan. They are now optimistic but wary about the likelihood of entering Gaza. Arriving at 2 pm at Rafah’s closed gates, Khalil and Linda were told they must first return to Al-Arish to fill out border-crossing forms with officials based there before their crossing will be considered. The two, having been on the road for 10 days and already having faced days of bureaucracy and waiting,refused to leave the area, afraid that roadblocks might prevent their re-entry the following day. 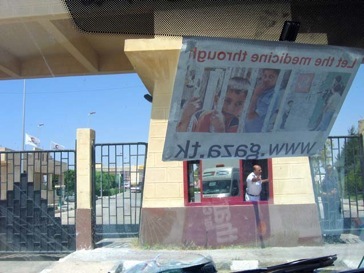 After a warning from Egyptian authorities that the area in front of the border was now a closed military area forbidden to foreigners, Linda and Khalil relented, leaving the vanparked at the side, waiting to enter and deliver its goods. Thevan also carries desperately-needed medication for heart conditions and diabetes, as well as syringes, bandages, swabs, antibiotics. The Gaza-based Popular Committee Against the Siege (PCAS) last reported the number of victims who had died preventable deaths as a result of unattainable medical care under the siege as 212, the last two victims being an 11-month-old infant and a 44-year-old father of eight. Both died on Sunday, after being denied permits to exit Gaza for treatment. PCAS lists 107 classes of basic medicines that are depleted in Gaza, 97 more nearing depletion, 136 halted or not functioning medical instruments,and over 1,500 patients who need to leave the Strip for medical treatment. Despite the June 19 agreement to halt Israeli military operations, invasions, and indiscriminate shelling on Gaza, in return for an end to the launching of home-made rockets from Gaza towards Israel, Israel has not met its obligations in opening the borders with Gaza and allowing in adequate amounts of food, medical supplies, construction materials, fuel, and other vital elements denied the civilian population for well over one year. Instead, the opening of Rafah, and the passage of goods into Gaza via other crossings, has been put on hold, used as a bargaining tool for the release of Israeli solider Gilad Shalit, even though his release was not part of the ceasefire agreement. Khalil and Linda remain hopeful that they will enter and bear witness, deliver aid and a message: the siege is inhumane, and if the international political community won’t do anything to end it, civilians will. 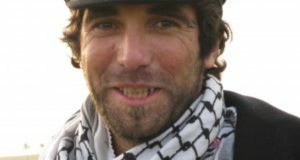 Their success may be echoed by the efforts of a team of over 50internationals, including Israelis, who aim to reach Gaza’s coast by water.